I had an awesome food weekend. My mother-in-law and her husband came to visit us and it was like being on a food-centric vacation for five days. I love all aspects of the food experience – getting ideas about what to cook, shopping for ingredients, cooking a wonderful meal, sharing it with others – I love it all. My mother-in-law shares this same love. While she was here, I asked her to help me find some food inspiration and to try out some new recipes. She was happy to be my co-conspirator in this endeavor. We talked about dishes we had made lately, we had endless fun at the grocery store and picking out wine based on how pretty the labels were, and we cooked (and laughed) and cooked some more. Even cleaning the kitchen is more fun when she’s around. 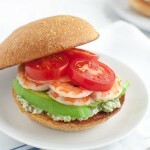 Of the several recipes we made this weekend, these shrimp sandwiches were the biggest success. Everyone devoured them including the kids. The tarragon-caper mayonnaise elevates this simple sandwich to new heights. Despite having several ingredients with strong flavors like onion, capers, celery, tarragon and hot sauce, the mayo spread never overpowers the shrimp. It just enhances the flavors of everything else in the sandwich and lets them all shine through. In a medium bowl, mix together mayonnaise, capers, grated onion, tarragon, celery seeds, and hot pepper sauce. Season with salt and pepper to taste and add more hot sauce, if desired. Cover and chill mayonnaise mixture until ready to use. Lightly butter cut sides of hamburger buns. Heat griddle or skillet over medium heat. Place buns, buttered side down, in hot skillet and cook until golden, 1 to 2 minutes. Spread mayonnaise on bottom half of each bun. Top with shrimp, tomato, avocado, and lettuce. Cover with top buns and serve. Mayonnaise can be made 6 hours ahead. Recipe adapted from Bon Appétit, August 2007. These shrimp sandwiches look and sound delicious. Love how simple and easy they are to recreate – a recipe I can definitely see myself making. Thanks! They really are very simple and oh so tasty. Hope you get to enjoy them soon. The tarragon-caper mayo definitely makes the sandwich. I am tempted to try it with other sandwiches too.